Though my ancestors were part of the colonial movement in the exploitation cheap labour from India to the Caribbean (latter part of the 1780’s), I have always postponed travelling to the land they were shipped from. I wished the India of my imagination, largely shaped by my Hindu Grandmother and the passed-on memories from her parents and grandparents to us, would remain just that way – in my imagination. 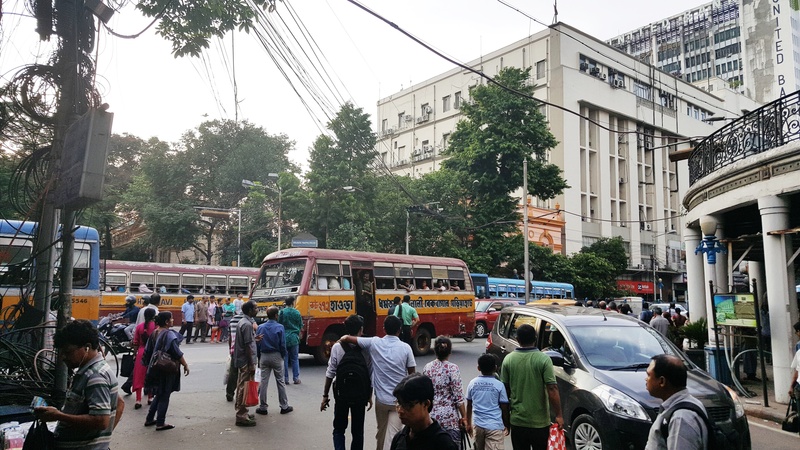 My work, however, demanded a visit in the early part of June (2018) to India (Kolkata), ending my well-kept desire. I am only the second of the clan to ever visit India. I cannot recall stories or evidence about any of our family who ever returned to India after their period of indentured-ship. There may have been such returnees, but I doubt it. Kolkata, though, is the port from which my ancestors (Hindu and Muslim) travelled. Up to the early 1860s recruits in North India were drawn from in and around Calcutta and from the Chota Nagpur plateau, a sub-division of the Bengal Presidency about two to three hundred miles from Calcutta . Recruiting operations were pushed further north-westwards and the North-Western Provinces and Oudh (Modern Uttar Pradesh) and Bihar became the main suppliers of colonial labour. My foreparents would come from places such as Lucknow, Bihar or Uttar Pradesh. What I know is that my paternal grandmother’s birth certificate stated her ethnicity as Calcutta and that she spoke Hindi and Bengali. My return to this place evoked emotions of indifference, curiosity, some faint memories, and me trying to imagine what it must have been like at the time when my ancestors were moved from here. After a few hours in the place, I was strangely drawn into the surroundings, the sounds, the smells, the tastes and the chattering – though in both an unfamiliar tongue and yet some familiar words. The foods were largely familiar – even though only some of the names recognisable given its creolised versions in Guyana. 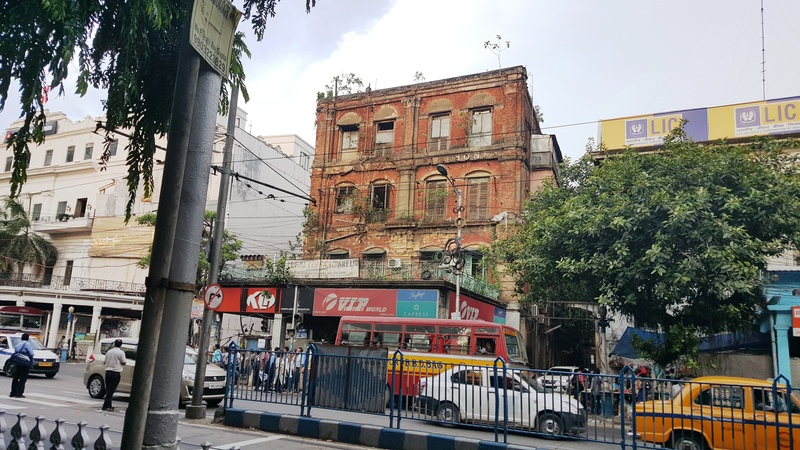 What rescued me were the familiar tastes which brought back memories of ‘home’ and unknown connections with Kolkata. The cacophony of synchronised car-honking nearly drove me mad in the first few hours, but I soon got accustomed to it. The scale here was far larger than Guyana, but it was the same habit. And the friendliness and always helpful nature of the people reminded me of my grandparents’ home and that of the people of our Indian community/village in Guyana. Then there were the other connecting bits: the noise of animals, the scent of perspiring bodies, fruits, spices and food being cooked. I felt as if I recognised faces similar to that of each member of my family, past and present. I, though, baffled most people at my hotel, in the restaurant, the gathering I was part of, and even on the streets. I looked Indian (like a Northern Indian and Bengali) yet somehow the way I walked, how I looked, my inability to tilt my head left or right, my Caribbean disposition, and way I spoke marked me out as different. Where was he from? People largely deduced that I may be an Indian of the recent diaspora. Very few connected me with the earlier story of forced migration during the British Raj. I was an anomaly and most seem not know this part of their own history. I was largely a mis/displaced Individual. Our gathering-opening act of worship was interesting in a variety of ways. It took place in St. Paul’s Cathedral (of the Church of North India). The edifice represents an impressive legacy of colonial times. The plan for the building was determined by the army (one Major Forbes) and the East India Company in 1840 gave a large grant for its construction. The foundation Stone was laid in 1839 one year after (1838) that the two ships Whitby and Hesperus sailed with my ancestors to Guyana. The initial role of the Cathedral was that of serving the Church of England. The point of the link with colonial history is also evident as one enters the building (main entrance) with the numerous memorial stones! 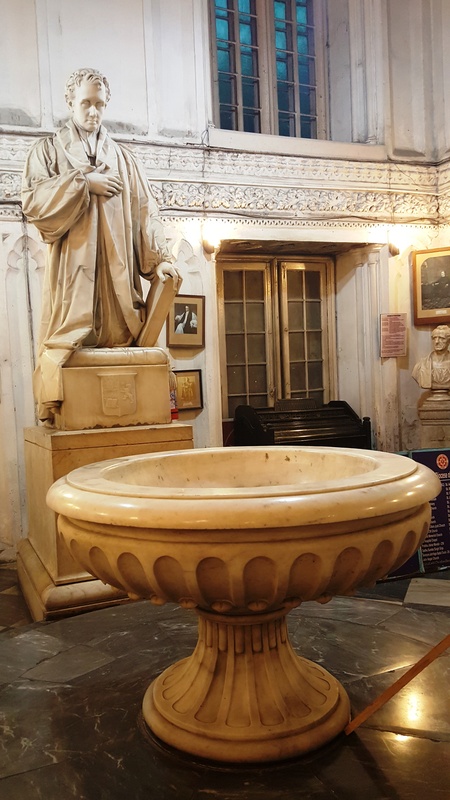 The walls of the Cathedral are a historical feast of colonial legacy with some familiar names to those who follow British history, especially that of the East India Company. It was clearly a church built as a statement. This is further highlighted by the imposing marble statue overlooking one of the most massive baptismal fount I have even seen (though without any water). I can imagine the screaming symbolism of overflowing grace, tempered by the stark reminder of how colonial and missionary narratives intertwine in a complex embrace. I was also curious about the imposing stained glass windows (a gift from the Dean and Chapter of St. George’s Chapel Windsor). The one that caught my attention was that of Jesus and the children with that very familiar quote of ‘suffer not the children”. What came to my mind is Sharada Sugirtharajah’s critical reading of Max Müller’s Cambridge lectures (1812) in which one of his working premise on the relationship between Hinduism and Christianity was that of child and adult. In developing his thesis, Müller employed a version of Darwin’s evolutionary hypothesis to demonstrate the infantile nature of Hinduism (and Indians) as compared to the superiority of Christianity (and Europeans). Hence, it was not difficult to transfer that to a whole population, representing the natives as ‘childish’ with Jesus and the Christian way an offering a mature and civilised faith. One view of the story behind the hymn “Dear Lord and father of mankind” suggest it was this mind-set at work in the hymn writer. The opening Worship focused on the theme of the meeting ‘healing relationship: hope for a new spirituality’ with one of the key phrases repeated being “inclusive communities of hope”. So we prayed that God “would change us into the people [God] need us to be that we might show [God’s] love in every place”, lifted up all sorts of minoritised groups and was sent out to “go into the world to build inclusive communities of hope”. There were some ironies, though: all ‘up-front’ leading the worship and celebration of the Eucharist were Indian males. A brilliant sermon by the preacher on nurturing inclusive communities of hope was spot on, though one got the impression of disembodied words being reeled out. The inclusive mantra looked like a joke with an all-male leadership team and the male gendering of the divine throughout. The whole liturgy was the most-wordy I have ever encountered – about 7635 words not counting the sermon and the announcements. I thought the Bengali tradition and love of poetry would have been reflected in liturgy. But it was lacking. The one thing that reflected a cultural practice was when those who entered the chancel area to receive the sacrament took their shoes or sandals off. In a strange way, I have arrived at the beginning of my journey. I am constantly being surprised by the ambiguous finality of destiny. Home, for me, will remain an elusive elsewhere. It is exciting. Thank you for this. I also came across your reflection on soil, which I’d not picked up before.